"OMNI by Terex is ground-breaking technology that will revolutionise the crushing and screening jobsite," Barry McMenamin, Group Engineering Director with Terex Materials Processing said. OMNI by Terex is a tablet based system that is fitted within the cab of a material feed excavator and provides centralized remote access to multiple machine control systems within a crushing and screening train. It has been diligently and intuitively designed to give unrivalled, easy-to-use control to the operator with information and views of the entire machine train. Kevin Calvert, Quarry Manager at Clifford Watts in the UK said, "We have been testing OMNI by Terex and we're impressed at how we're able to view working information from live cameras as well as the level of control we have—all from the comfort and safety of the excavator cab." The OMNI by Terex system allows the excavator operator to view working information from each machine that is connected to the system, make informed decisions about each machine's operation, and remotely manage the entire machine train to maintain high efficiency and produce the required material specification. Additional features include alerts that indicate when someone on the ground is making process adjustments and an option for other personnel on the jobsite (such as the wheel loader operator) to have read-only system access, enhancing their efficiency through remote view of the operation and timely interaction. As well as unveiling the new ONMI by Terex technology, the Powerscreen team was on hand to talk to bauma visitors about three upgraded Powerscreen machines—the Chieftain 2200, Trakpactor 550SR, and Metrotrak—all of which are impressing customers around the world with consistent positive feedback on the value-added features. The Powerscreen Chieftain 2200 is designed for operators who require large volumes of high specification products with maximum versatility. User benefits include a quick set-up time (typically under 30 minutes) with hydraulically folding conveyors and track mobility. Its high aggression screen boxes handle dirty, sticky material with ease. It has been much-admired the world over for its exceptional processing power, enabling many Powerscreen customers to double production. Alabama Aggregates in the U.S. has a Chieftain 2200 that is producing 40 percent more than other screening plants they have tried, an important benefit for a company that operates 24 hours per day, seven days per week. The Powerscreen Trakpactor 550SR horizontal shaft impactor is designed for processing primary and secondary materials, such as natural rock and construction-derived materials like asphalt, recycling and demolition waste. Daracon Australia, who recently purchased the machine explains, "We run a large fleet of the Powerscreen machinery—in excess of 60 mobile crushers and screens. The support we get from Lincom Australia is excellent, the team are always there when required. We were looking for a new impactor and the features of the Trakpactor 550SR sounded perfect, so we viewed one working in a quarry in the UK. When we saw this machine in action and the changes made from the old 500SR, such as ground-level serviceability and the versatility of screen recirculation, our minds were made up. The Trakpactor 550SR is now working in our fleet, and we are extremely happy with the outcome." The Powerscreen Metrotrak is a highly compact, high performing track mobile jaw crushing plant featuring the "M" series single toggle jaw crusher. With an aggressive crushing action and a high output even at tight settings, the Metrotrak is ideally suited for operators on the mining, quarrying and recycling industries, especially those working in urban locations or where space is restricted. 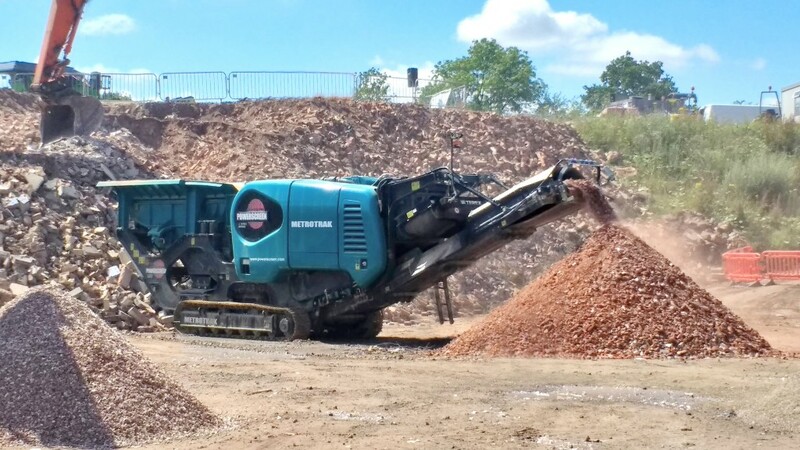 Jan Smith, Owner and Managing Director of Welton Aggregates in the U.K. said, "It's a great crusher—for a little crusher the output is incredible - it far exceeded my expectations. We took is on demo from our dealer, Duo Ltd, and never let it leave the site." Colin Clements, Powerscreen Global Product Line Director said, "Since we have the most comprehensive range of machines in the market our focus is on improvements because we know what is most valued for our customers—making our machines easier to use and service, and to be more effective. Our equipment, along with our industry-leading Powerscreen Pulse Telematics system and now with the option of our new OMNI by Terex technology is an unbeatable combination and this year's bauma—the world's largest event for our industry—has been a fantastic opportunity to get showing the benefits to our customers."